The RS Chimney and Fireplace Fan is the guaranteed solution to stop smoking fireplaces. The extremely quiet and reliable chimney fan maintains the perfect draft to ensure a smoke free environment. The fan is easy to use and virtually maintenance free. It can be used with wood or gas fireplaces as well as coal and oil fueled appliances. The fan duplicates as a ventilator: Simply turn it on to rid your home of stale air, cigarette smoke, etc. Used on homes nationwide for their unique solution for draft induction, the Enervex Exhausto fan can even be found atop every fireplace flue at the White House in Washington, DC. The reason for this is that a ratio exists between the fireplace opening and the flue size. If the fireplace opening size is too large, and the flue size is too small, smoke will come back into the building. Unfortunately, every fireplace opening in the White House is designed far too large and shallow. Thankfully the Exhausto fan solves this dilemma by generating additional draft which pulls the smoke up the flue. If it works for the President, you can rest assured it will work for you. There are a few common reasons we see locally where customers will need an Enervex Exhausto Fan. As mentioned previously, an incorrectly designed fireplace will cause smoking issues if a draft can not be generated. However, another common use is when relining a fireplace flue which had terracotta tiles that were damaged in a chimney fire. Now, the fireplace ratio may call for a 13" liner but since the building construction physically limits the size of the liner installed to say an 11" we install an Exhausto Fan to generate the additional draft without reducing the opening of the fireplace. This is done so the customers can enjoy the largest size opening on their fireplace as possible. Only on very old homes is it required to reduce the opening AND add an Exhausto fan with a reline but for homes over 100 years old it certainly can be a possibility to make it work safely. Two year factory warranty, 10 year corrosion perforation warranty, and a 6 month UNCONDITIONAL money back guarantee. 110V energy efficient and maintenance free motor consumes energy equivalent to a standard light bulb. The compact design of the fan makes it barely visible from ground level. 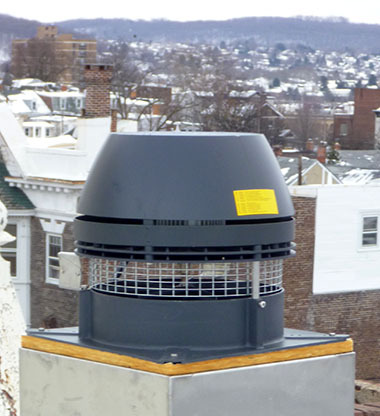 However, the fan may be recessed or hidden behind chimney top enclosure such as copper caps, shrouds, cupolas, etc. Available with or without top mounted dampers. For further specifications please feel free to download the Enervex Exhausto product sheet in PDF format. For more information on our Class A offerings please contact us and we will get back to you as soon as possible. We would be happy to provide a solution suited for your particular needs.